The understanding of fluctuations in systems far from equilibrium is one of the key issues of non-equilibrium statistical thermodynamics. The Fluctuation Theorem of Gallavotti and Cohen (1995) [GCFT] portrays some symmetry features of entropy production rate and deviations in non-linear and far from equilibrium regime. In this framework, the turbulent solar convection, observed in the photosphere and viewed as a dissipative non-equilibrium system near a steady state, provides an incomparable laboratory where to attempt a test the GCFT. In fact, solar convection flows emerge in the photosphere in terms of a structured pattern: the granulation. High resolutions spectro-polarimetric data acquired with Interferometric BIdimensional Spectropolarimeter (IBIS) instrument installed at the Dunn Solar Telescope (DST) are used to perform this analysis. Here, we present a preliminary analysis of the validity of the GCFT in the solar convection field. 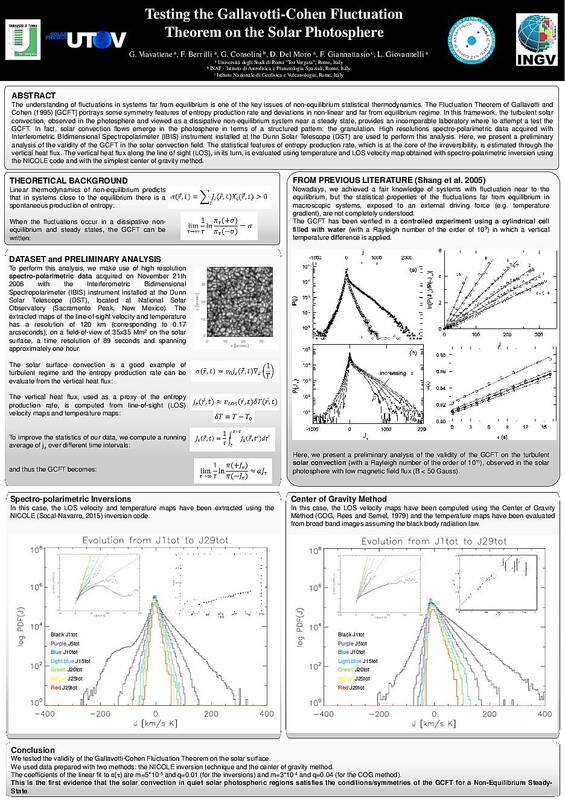 The statistical features of entropy production rate, which is at the core of the irreversibility, is estimated through the vertical heat flux. The vertical heat flux along the line of sight (LOS), in its turn, is evaluated using temperature and LOS velocity map obtained with spectro-polarimetric inversion using the NICOLE code and with the simplest center of gravity method.